A green pool is the last thing any pool owner wants to see, so why does it happen and how can you turn your pool from green to clean? A pool turns green when there is algae in the water. There are several reasons why algae could grow, but it is most commonly caused by prolonged exposure to the sun, rain and temperature spikes. These factors affect the chemical balance of the pool and result in the pool turning cloudy and/or green. If your pool is looking more green than clean, use our top 5 tips to get your pool back to healthy. A water test will provide you with an in-depth analysis of the exact chemical dosages you pool requires to remain in top condition. Collect a sample from about an arm’s length under the water surface. To have an accurate analysis, aim to have the water tested within a few hours. Head to your local Poolwerx store to receive your 60 second computerized water test for free. After you have received the chemicals to help clear your pool, make sure you test the pump, and check the filter, skimmer box and pump to ensure they are working and there are not blockages. If you are unsure about whether your equipment is working effectively or not, a fully qualified Poolwerx technician can come to your home and complete an assessment. After the water test, you will be provided with the chemicals you need to re-balance the pool water. You will likely need chlorine as pools usually turn green when the chlorine levels are too low. Avoid swimming when re-balancing your pool as high chlorine levels can cause red eyes and itchy skin. To help loosen dirt and remove algae, brush down your pool walls with a pool brush and vacuum the area. Using a robotic cleaner [link] can help save time and effort. Whether you plan to swim in your pool once day or once a month, continuing a regular maintenance schedule will help keep your pool healthy year-round. 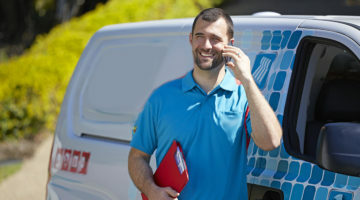 Your local Poolwerx team of fully certified technicians can create a personalised maintenance plan to suit you. Give them a call today! When was the last time you had your pool water tested? Keep your pool healthy year-round and avoid waking up to a green, cloudy pool by giving the experts at your local Poolwerx a call today. Choosing Between a Saltwater Pool and Chlorine Pool Whether you are building a new pool or thinking of converting your pool it is important to know the pros and cons of both saltwater and chlorine pools.